Every country has its own unique set of myths and legends that lend themselves to the culture and history of its people and the United Kingdom is no exception. Indeed some of Britain's myths and legends are among the most well known in the world: here are just a few. There have been many sightings of the Loch Ness Monster - or Nessie as it is affectionately known. Some of the earliest reported sightings of Nessie date back to 1933 when the now infamous monster was allegedly photographed swimming in the waters of Loch Ness. 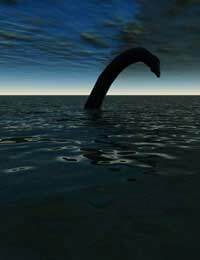 It has never been proven as to whether or not Nessie does exist but speculation has been rife in the last twenty years that Nessie could be a previously unknown prehistoric creature that has managed to survive through generations. Although Nessie provides much amusement and tourism trade it has never been positively identified as being an actual species or simply the product of an over active imagination. Saint Patrick is the patron saint of Ireland but was originally born on the British mainland. Of Roman decent Saint Patrick was taken as a slave to Ireland where he escaped and eventually made his return home. Afterwards he became a member of the church reaching the lofty heights of Bishop. Saint Patrick's most famous exploit involves his driving all of the snakes from the island of Ireland and watching them drown in the sea. Although as time has moved on it is more likely that the serpents that were spoken of were metaphors for the Druids who were prevalent at the time. The Lambton Worm is the North East of England's own tale of mythical creatures and tells the story of John Lambton, a young boy who decides to miss going to church. He is told by an old man along the way to the river where he is going fishing that nothing good will come from missing church. Lambton's punishment for this is to encounter a worm which he throws down a well where it grows in size and also becomes carnivorous. The worm then proceeds to terrorise locals and kill their livestock until Lambton returns from the crusades and sets out to dispatch the beast himself. One of Britain's most famous legends is that of King Arthur who managed to pull the fabled 'Excalibur' from the stone to prove that he was the rightful successor to his father's kingdom. The story tells of how the magician Merlin sets the sword in stone so that the rightful successor - and only the rightful successor - shall be able to remove it. Along the way King Arthur and his Knights of the Round Table carried out heroic deeds in order to help those in distress and need and also set out on a quest to find the legendary Holy Grail, reputedly the chalice from which Christ drank at the Last Supper. There are many and varied legends and myths which vary from region to region in the United Kingdom. Many of them have similar themes running through them and their locales and characters change as the regions and cultures change. A visit to your local library or Museum will unearth many myths and legends that perhaps you were not aware of and will certainly be something to stimulate the most enquiring mind.